The Revolabs FLX wireless conference phone is being used by YOTEL New York to provide audio quality for conference calls in the hotel's three exclusive VIP cabin suites. Located at Times Square West, YOTEL New York is the YOTEL brand's first city-center hotel outside its international airport locations. The unique hotel offers 669 stylish cabins, including three VIP two-cabin suites. The VIP cabins are equipped with workstations, free Wi-Fi, and boardroom-style tables that convert into billiard tables. For business calls, a Revolabs FLX wireless conference phone is available to the guest free of charge. "For YOTEL and its guests, the FLX provides the ultimate in flexibility," said Yefri Gatica of YOTEL. "It can be installed easily and quickly by YOTEL staff, and allows users to roam about their spacious suites during meetings without being held back by wires. In addition, the FLX offers a sleek, modern look and delivers uncompromising performance in a compact, unobtrusive form factor. Other solutions we looked at lacked the FLX's modern design and wireless capabilities, and were offered at almost double the price." The Revolabs FLX combines wireless operation, high-quality wideband audio, 128-bit encryption, integrated Bluetooth, and support for analog and IP. Available with a variety of compatible Revolabs microphones, the Revolabs FLX microphone option includes a lapel microphone, worn by one person; an omnidirectional tabletop microphone that captures the sound of six to 10 participants; and a directional tabletop microphone that enables audio capture from two to three people. Because the Revolabs FLX dialer operates like a telephone for handset calls and enables the setup of conference calls, there is no need for a separate desk and conference phone. 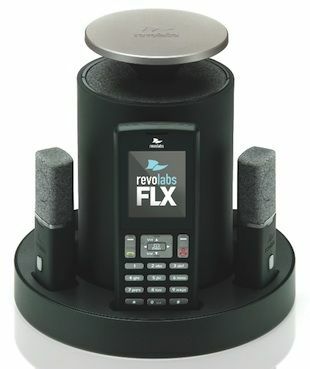 The Revolabs FLX can also serve as the audio interface with virtually any major brand of video-conferencing equipment, providing the same high audio performance within video calls. "We've received a lot of requests for the FLX phones by our VIP guests, and it has proven to be a winning solution to meet their business needs," Gatica said. "Users have been impressed by the FLX's ease of use, style, and wireless capabilities, in addition to its strong performance and reliability."